Sea anemone in the rocky intertidal zone. The Otterbahn Trail begins at the lush boundary between Seldovia’s woodsy outskirts and a tract of undeveloped rainforest. Watch for Wilson’s warblers, song sparrows and chickadees. Within a few yards, the trail enters the dim, jungled forest with Lutz spruce trunks rising like columns over a mossy understory of devil’s club and brush. To spot conifer-seeking forest birds such as three-toed woodpeckers, watch for motion in the boughs overhead and listen for tapping. Porcupines can sometimes be seen waddling near the trail. Black bears pad the same route as people. Though they are rarely seen, keep a lookout for their “cow pie”-like scats, laced with grass and berry husks. More birds can be spied where the trail traverses alder thickets, and then crosses a boardwalk over a salt lagoon. The route ends at the western section of the Outer Beach. Nearshore waters and rocky outcrops draw seabirds, bald eagles, northwestern crows and sea otters. The 1.2 mile trail traverses several distinct habitats as it descends to the coast. Old growth forest, dominated by western hemlock and Lutz spruce, shelters a diverse understory. Disturbed sites grow dense stands of alder. Beach and intertidal habitats stretch along the coast. Nutrient-rich marine waters draw birds and sea otters close to shore. Watch for “boat knee trees” where the curved bases of tree trunks were harvested to build boats. 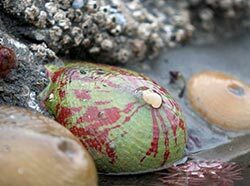 To view the lush garden of seaweed and marine animals in the rocky intertidal zone, choose a calm day with an ebbing tide. Walking the shore to the Seldovia Outside Beach can only be done when the tide is below 10 feet. Stay on the trail to avoid private property. Wear rubber boots or water shoes. Walk carefully in the slippery intertidal zone; a walking stick may be helpful. Ask locals or the boat crew to point the general direction. From the harbor on Main Street, take English Drive uphill to Winifred Avenue and walk a few hundred yards to the Susan B. English School. The trail begins behind the school. Another access exists at Outside Beach Park about a mile out Jakolof Bay Road.